Lesser Appleworm LAW -- 1st LAW flight begins around: May 12, Thursday. Peak trap catch: May 23. Oriental Fruit Moth OFM -- 1st generation OFM flight starts: April 23, Saturday. 1st generation 55% egg hatch and first treatment date, if needed: May 31, Tuesday. 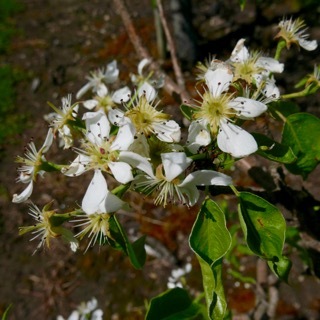 Plum Curculio (PC) -- Increased risk of PC damage as McIntosh and similar varieties increase fruit size: May 22, Sunday. San Jose Scale (SJS) -- First adult SJS caught on trap: May 21, Saturday. Spotted Tentiform Leafminer STLM -- 1st STLM flight, peak trap catch: May 6, Friday. 1st generation sapfeeding mines start showing: May 21, Saturday. Optimum sample date is around Sunday, May 22, when a larger portion of mines are visible. 19-May, 2016 (Thursday) RIFGA Twilight Meeting, Phantom Farms, 2920 Diamond Hill Road, Cumberland, RI. 5:30 PM. 2 pesticide credits will be offered. Light dinner/refreshments will be served. $20 meeting fee (free for RIFGA members). Pre-registration is not necessary. Contact: Heather Faubert, 401-874-2967. • Diseases, all under control this week, no worry about fire blight unless until it warms up quite a bit. Check. (But see Dan Cooley et al comments.) Insects, still not much happening until plum curculio becomes active and fruits size up towards the end of NEXT week. Plus no insecticides during bloom. (Except OK to use B.t.) Check. (See Elizabeth Garofalo's Insects report from the field, next.) Horticulture, fruit set, and thinning. Wake me up when it's over, not much has changed, still waiting until petal fall and we see any fruitlet growth. Pollination (bee activity) has been pretty much non-existent until now, looks like we should have several days now to get the job done. Much remains to be determined as flowers are still looking compromised, but we have to assume there are some good ones out there too. I really doubt anyone is going to rush to put a petal fall thinning spray on, I would want to wait until I see that fruits are set and growing. So, that check-box remains unchecked for now on this one. See Duane Greene's comments below. The sun is finally out and so are the bees! 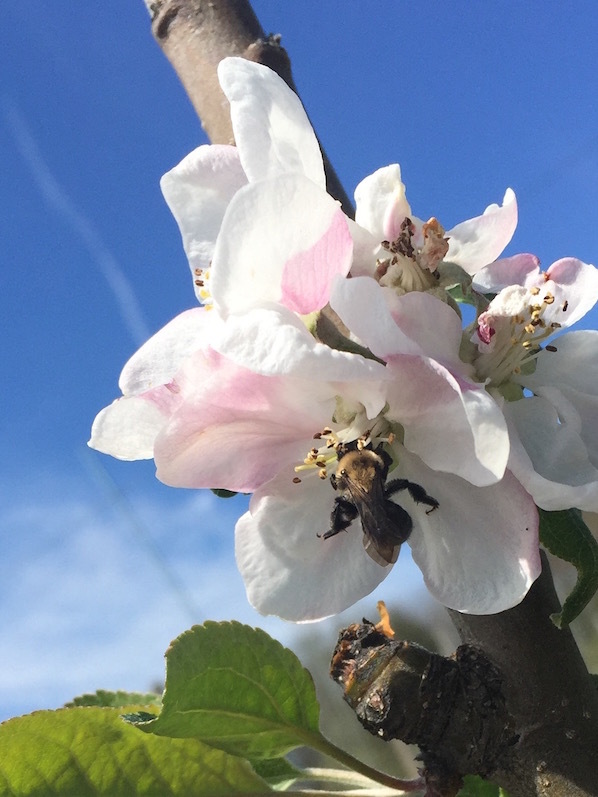 On an orchard tour today several different pollinators (wild and hired in) were seen zipping from flower to flower (pict below), a great sign for all the viable buds still on the trees. Of course with the sun out, following all that cool wet weather, the weeds are happy too. The grasses have been going strong all along and now the broad leaf weeds (like the wild buckwheat vine, pict below) are greening up. While growers have no love for this weed, dock sawfly (again, see the pictures) positively adores living in it! Green fruit worms are still on the move (pict below, unless you have recently knocked them back with an insecticide spray. (No insecticides during bloom please! Except B.t.) Don’t think that no crop on those peaches means no disease pressure, peach leaf curl (pict below) loves this cool wet weather we have been having! But of course it is too late to do anything about it except cut out the worse of it and remember to apply a fungicide in the fall after leaf drop or before bud break in 2017. Enjoy the weather -- did you see the clouds in the sky today, quite stunning! Finally! bees were out doing their job today in force! Green fruitworm sp., or winter moth? 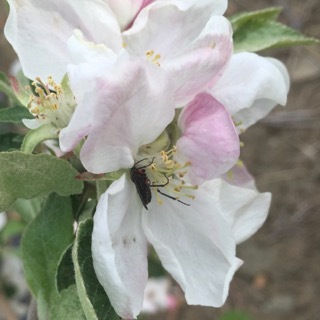 Can't spray now because trees are in bloom, except B.t., but these guys will feed on fruits later and cause damage, however, typically not significant. A native sawfly sp. 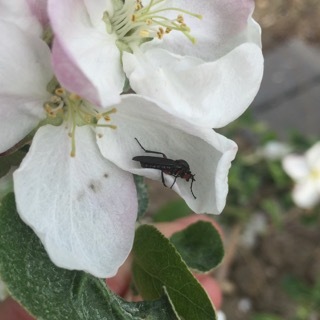 (not European apple sawfly we don't think)* which appears to be quite content feeding at the base of an apple flower; can't imagine this guy is not doing some kind of damage? 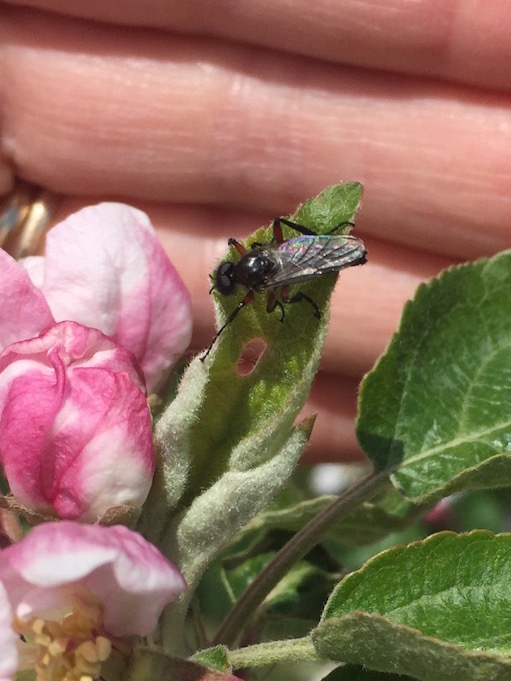 Here he/she is dislodged from the base of the flower -- positive ID* anyone? * According to Jennifer Forman-Orth, Environmental Biologist, Crop & Pest Services, Mass. Dept. of Agricultural these in fact are more likely " a march fly (Diptera), Bibionidae family, likely Bibio femoratus. 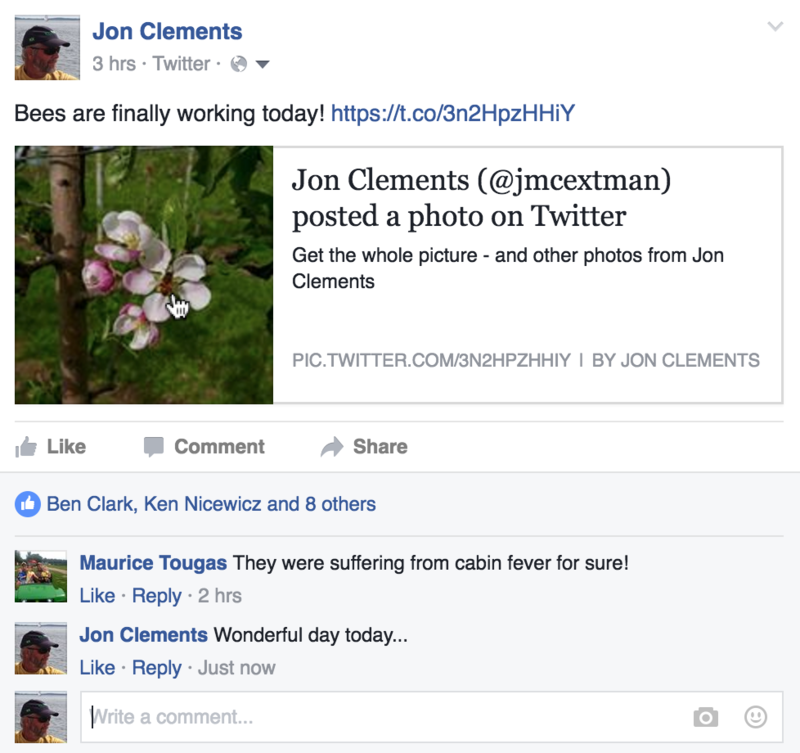 The adults are pollinators. The larvae should not be harmful to fruit trees. From here, the bottom two photos also look like march flies, based on the raised thorax." Thanks for that clarification/positive ID Jennifer. More numbers! More spores! We are still plugging away at ascospore maturity here in the lab. Today we found 94 mature spores in the petri plate assay, 2,340 in the funnel trap and 47.2% overall maturity in the squash mounts. I’m beginning to feel like a bit of a broken record but I suppose that’s how primary scab season goes. So, the read on all those numbers is: there is another infection event coming our way. As the forecast stands now we could be looking at this coming Friday and Saturday for the next scab infection. 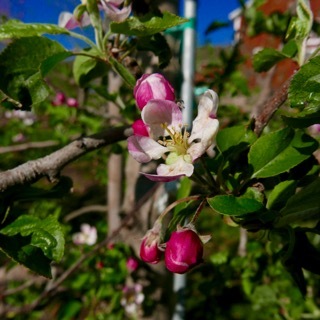 This early part of the apple growing season has moved slowly. We still don’t know what the actual state of the crop will be, and so can’t afford not to carefully manage scab. The different models are predicting an end to primary scab season as early as a week from now. More likely, it will extend for at least another two, close to the end of May. 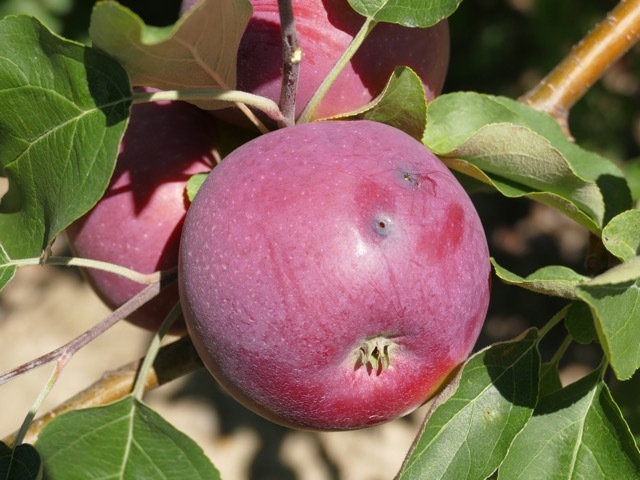 Some years apples will develop rots at the calyx ends of fruit that can cause significant damage at harvest. However, these rots often start at petal fall, if there is extended wet weather. That is, if we get several days with wet drizzly weather. A number of fungi can cause these kinds of infections, and symptoms vary somewhat. 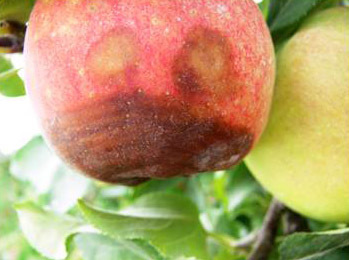 Black rot, which can cause many types of infections, can get going early. 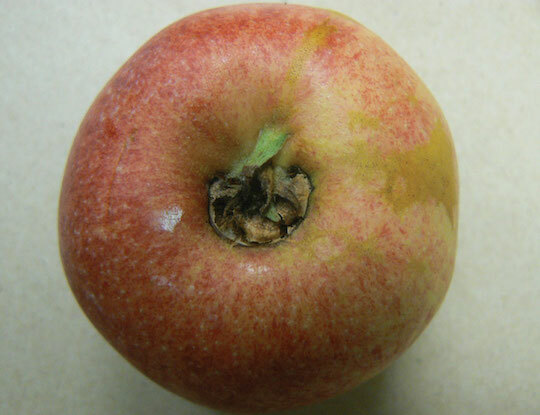 These infections eventually cause concentric brown rings working out from the calyx end and extending up the fruit. Calyx end rot and blossom end rot are rarer, and caused by different fungi, most commonly Sclerotinia or Botrytis. These rots do not develop as far as black rot infections, but can disfigure the calyx ends of fruit. Calyx end rot is light brown dry lesion, slightly sunken with a red border. 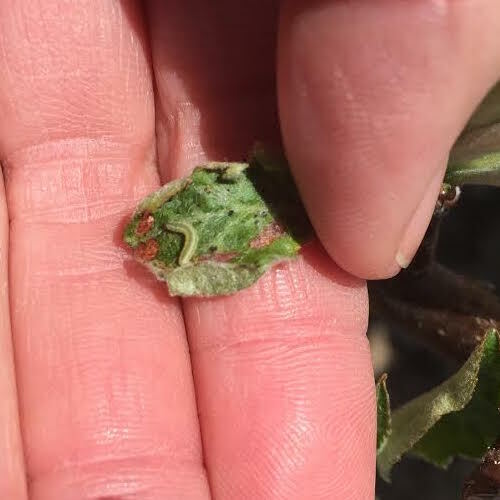 Black rot symptoms at the calyx end have concentric dark and light rings and tiny pimple-like black specks, pycnidia, may be visible. To reduce the inoculum for black rot, prunings, dead wood and mummies should be removed from the tree and moved out of the orchard. It isn’t clear where the inoculum for the other end rots comes from. However, in all cases, sprays of captan plus Topsin applied at petal are very effective controls. It is bloom in most parts of Massachusetts and surrounding areas. Normally that would mean we would be carefully checking the fire blight forecasts to see if we need to spray streptomycin. Not this year. 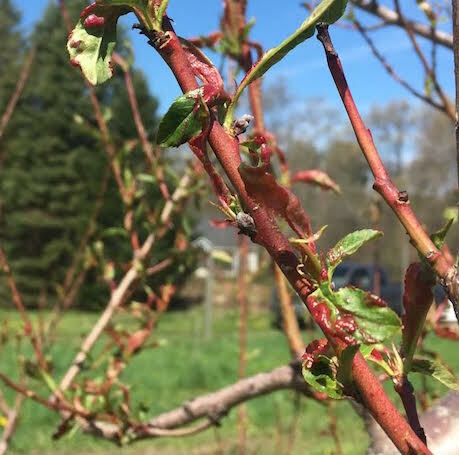 Anyone who has been involved in apples for more than a few years realizes that this is not fire blight weather. It’s too cold and too dry. But, to be on the safe side, it’s important to check the models. So we did. Basically, they say it has been too cold and too dry. During the past week the weather has been cool, cloudy with rain. Consequently, flower development was slow but sufficient to show a little more clearly the cold damage sustained earlier in the year. 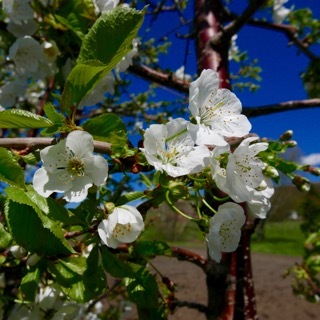 I have noted blossom clusters with 1 to 5 flowers. The flowers present may have deformed parts and pedicels of varying lengths. 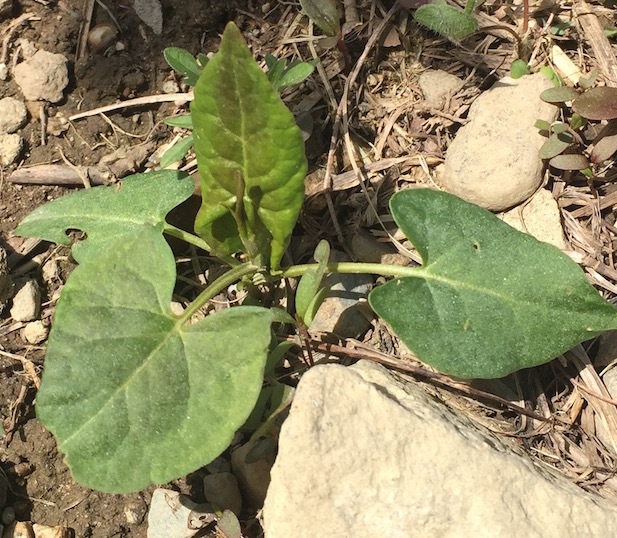 Equally notable were smaller- than-normal spur leaves and spur leaves that were crinkled and cupped with a red tinge. It is not possible to predict if flowers on these spurs will start to grow and size. I also noted that the severity of damage on these spurs was variable depending on the cultivar, and location in the orchard. 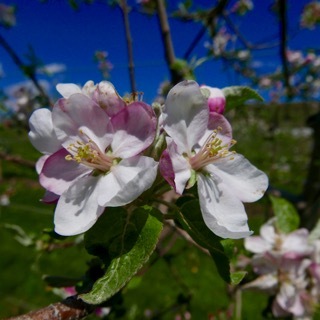 Where damage is visible and the growth potential of these flowers/fruit is unknown, I feel that it is prudent to see how many fruit grow to the 6 mm stage. It is only at this time that you can assess initial set and make an informed and intelligent decision if you will thin and if so how aggressive it will be. 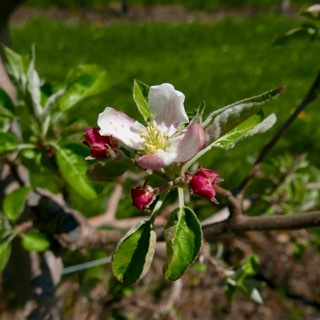 There are blocks and orchard where the severity of cold damage is not as apparent or damage can not be seen. In blocks with very little or no apparent damage that are traditionally thinned starting at petal fall, a thinning spray may be appropriate. Carbaryl, Amid-Thin or a low rate of NAA may be applied in the petal fall spray. This year I suggest that you should be very cautious when making the thinning decisions! No video this week -- did you like Dan Cooley's RIMpro instructional video from last week? If so, let him know, maybe he will make another one? The next Healthy Fruit will be published on Tuesday, May 17 (or thereabouts), 2016. As always feel free to get in touch with any member of the UMass Fruit Team (http://extension.umass.edu/fruitadvisor/team-members) if you have questions or comments.